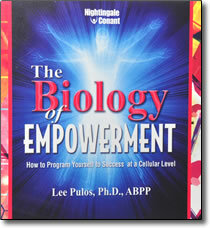 Biology of Empowerment CDs by Dr. Lee Pulos – Discount! In other words, your cells are compelling you toward very specific situations and outcomes – often in direct opposition to your conscious and even subconscious intentions! You see, beliefs create reality. If you want to change your life, then you must change your beliefs. But emerging research has revealed a critical catch in this universal truism – belief doesn’t merely affect the body. It IS the body! In The Biology of Empowerment, Dr. Lee Pulos distills decades of research in the fields of human physiology and quantum physics (including groundbreaking NEW findings) into an extraordinary set of tools that will enable you to quickly identify and then change – at the conscious, subconscious, AND cellular level – the belief patterns that are holding you back from growth, change, and total personal success. Receive answers from the deepest, most knowledgeable levels of your consciousness to questions like, What is my life’s true purpose? … Should I take this job? … Is this person “the one”? Permanent personal transformation is possible … and it all starts at a cellular level. The Biology of Empowerment will equip you with the most powerful tools ever discovered for creating rapid, lasting changes that will naturally propel you toward wealth, health, happiness, or any goal you can think of! Quick, easy, and extraordinarily powerful, Applied Kinesiology (also known as muscle testing) opens up a direct line of communication with your physical body, giving an actual, understandable “voice” to your cellular structure. Excellent for identifying the root causes of fears and revealing the hidden roadblocks to success, this brief procedure is ideally practiced at night, in the moments before falling asleep. By following the simple step-by-step imagery procedure you’ll discover in The Biology of Empowerment, you can receive a vivid answer to any question you ask … in just seconds! One of the oldest diagnostic techniques available – and, when it is done properly, one of the easiest and most accurate – the Pendulum has been used for thousands of years in many different cultures to access the Universal Mind and predict future events, divine truth, retrieve information at a distance, and receive answers to critical questions. You’ll learn exactly what a Pendulum is and how to use it to identify the core beliefs that are limiting your success, including precisely how and where to position the Pendulum for optimal reading … the specific phrasing you should use to get the most clear and accurate answers … which questions you should NOT ask when using the Pendulum, and why. Limiting beliefs become encoded in your body’s electrical system, stalling the flow of energy and resulting in anxiety, stress, phobias, poor health, sleep disorders, attention deficit, and a host of other problems. By focusing on a specific limiting belief and then tapping each of 12 points on your body in a precise manner and sequence, EFT enables you to instantly recalibrate energy flow and effectively “rewrite” the messages between your brain and your body, installing whole new belief patterns at the cellular level and alleviating the physical, psychological, and emotional effects of the previous patterns. Right now, at this very moment, you are laying the groundwork for your future – generating vibrational frequencies that project forward in time and then work to draw you down a very specific path. The Full Brain Programming Technique puts this process under your conscious control. Consisting of 30-second programming “bytes” that can be practiced anywhere, this technique empowers you to create new neurological grooves and energetic pathways that will carry you to the specific future outcomes of your choosing. Once these pathways are established, achievement becomes inevitable. This particular technique is especially prized by many of the world-class athletes Dr. Pulos has worked with, who use it to ensure peak performance, high scoring, and winning outcomes – with consistent success.